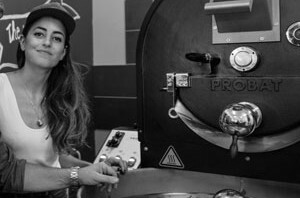 Jacqui: We use our own Common Ground coffee that we roast daily on site. Jacqui: As a founder of Common Ground I love being able to create something and then have the ability to see and interact with the people who consume it. It makes it worthwhile and helps us grow and develop what we do as the team behind the product. Jacqui: I’m loving a lot of the music coming from the Daptones record label. We’re playing a lot of Sharon Jones in the roastery and coffee bar. There’s a great energy in her music. Jacqui: Blue berries. Absolutely love them and have found they’re also quite the palette cleanser during a coffee tasting. Jacqui: I still remember the smell of coffee as a child when we visited Italy. It’s one of the strongest childhood memories I have. It’s the reason that years later I was drawn to coffee. Jacqui: Mineral water. I’m addicted to the bubbles and I can’t go back! Jacqui: I think coffee is best on its own, at least first thing in the morning. In the afternoon it’s my duty to make sure no left over pastries go to waste at which time an almond croissant is a coffee’s best companion. Jacqui: My favourite coffee to drink is a latte. Drinking coffee has always been my slow time in a very busy kind of lifestyle, so it gives me that bit longer to enjoy my coffee and enjoy my time. TCG: If you could pick one spot in the world to sit and have a coffee, where would it be, and what coffee would you have? Jacqui: I would love to be back drinking coffee on a frosty morning in New York. Staying in Williamsburg, we had lots of great experiences being treated to coffee and getting to know plenty of locals who were excited to have Melbournians in their venues. Chatting to hospo staff is always a great way to get to know people and to get some insight into a city. Jacqui: We’re looking forward to planning and building our next venue. The creative process starts again! I’m dreaming of a holiday / inspiration trip to the States. Heading back to New York and throwing in Austin and New Orleans will be next. Jacqui: We have an English Staffy named Duke. He’s the boss. I’m hoping one day he’ll be able to hang out full time at Common Ground. Jacqui: We spent a sunny Sunday morning drinking coffee and planning our engagement party. Took the dog for a walk. Went down to the Collingwood Children’s Farm, caught up with friends at the Sydney Road Festival and finished up with a late bowl of Pho on Victoria Street. There’s a lot to fit in when you’ve only got one day off in the week! Jacqui: I like straight up English Breakfast tea, with vegemite toast. It’s my comfort meal. Jacqui: I think there will always be a place for alternate brewing methods. There will always be people developing different ways to enhance the brew methods we use now and those who will invent new methods. I still see espresso as the everlasting brew method for coffee. This entry was posted in Barista of the week, Brewsflash, news2013 and tagged Common Ground, Jacqui Alexander. Bookmark the permalink.